Today's creative thing: a bit of hand lettering. In the form of a prompt! This is one of my favourite early prompts. A variation even appears on the back of my business cards. How 'bout this? 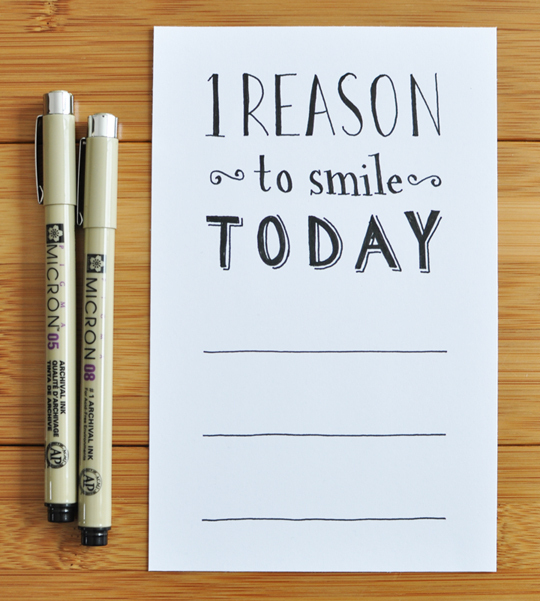 I'll tell you my one reason to smile today and if you feel like sharing, add yours in the comments! My reason to smile: With a lot of hard work on her part, my oldest daughter left for school today totally caught up on her homework. Recently, academic interests have begun to emerge where previously there was mostly disinterest. It feels as if we may have turned a corner and that puts a huge smile on my face. One reason to smile today is that I'm stocked up on my favorite Mio water flavor enhancer (orange tangerine). It tastes like Tang. I love it! I smile today because I am catching up on blogs amidst a clean home. I saw this yesterday but didn't feel like smiling. Sorry to read you didn't feel like smiling yesterday. It happens, right? Glad to read you're smiling today. My reason to smile today : Am on Day Four of eating better (read : no carbs, etc.) and I feel GOOD!